Metro's growth in ridership has never been pain free, but overcrowding on the Orange Line is reaching absurd levels. WMATA has already lengthened many trains to 8 cars, which is the length of the platforms. A shortage of rollingstock and power substation issues are preventing more trains from being lengthened, but even so, the day is coming when nothing can be done but add trains. This unfortunately, can only happen at the expense of the Blue Line. Metro trains can operate 90 seconds apart, but require 135 seconds of separation at locations where switches must be realigned between trains. In this case, the bottleneck is the "Rosslyn Portal," the area of tunnel just west of Rosslyn Station, where the Blue and Orange Lines diverge. Planners at WMATA have gotten a little extra capacity out of the system by running two consecutive Orange Line trains followed by one Blue Line train. This way, the switches don't need to be realigned as much--and that saves 45 seconds. This is possible because for every 2 Blue trains, WMATA runs 3 Orange trains. Still, the throughput is limited. Based on the 135 second headway, WMATA can run 5 trains through a given segment of track every 12 minutes. Each the diagrams below represents a 12 minute interval during rush hour. Each of the lines on the diagram represents a train in each direction. Therefore, a trackway with two lines (like between Navy Yard and Anacostia) represents a headway of 6 minutes--12/2. The first diagram represents WMATA's current service pattern during rush hours. *In the first version of my maps, I erroneously showed the Yellow Line going all the way to Fort Totten. During rush periods, the Yellow Line terminates at Mount Vernon Square. The corrected map is below. The chief limitation for the Orange Line, as you can see here is the 4 minute headway on the Vienna-Rosslyn segment. Adding one train would reduce headways to 3 minutes and would add a capacity of 1000-1400 passengers for every 12 minute period. Any additional capacity is sorely needed, but the segment of track between Rosslyn and Stadium Armory is essentially at capacity. Hence the so-called "Blue Line Split." Under this proposal, approximately every other Blue Line train leaving Franconia-Springfield would follow the Yellow Line across the Potomac, and up to Greenbelt. While this would shave about 8 minutes off of a trip between Franconia and L'Enfant, it would decrease the frequency of trains running directly to Rosslyn, Farragut, and Metro Center from Franconia. According to Metro reports, however, trips from the Alexandria/southern Fairfax stations to Farragut and Metro Center have been decreasing (by about 4%) while trips to the east side of Downtown (L'Enfant, Gallery Place) have been increasing (by 11%). 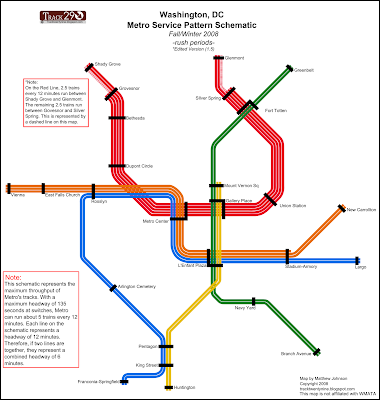 Under this scenario, all stations maintain their current headways or increase them except for Arlington Cemetery. To offset the Blue Line trains to Greenbelt on the east side of the system, the new Orange Line train that will be running in place of the Blue Line train will also run to Largo. While the Blue Line via Rosslyn is certainly less patronized, there could still be potential for overcrowding. This could be alleviated by making sure that all Blues via Rosslyn are 8 cars (which hold about 400 more passengers than a 6-car train). Still, some are understandably upset. But there is a greater good to think about. All they need to do is get to the Metro station 6 minutes earlier, and they'll get to work 6 minutes earlier. There is no trip time impact to Blue Line trains operating via Rosslyn. Of course, that's assuming that normal operations are underway. Since the Blue Line Split will increase efficiency and reliability at the Rosslyn Portal, riders via Rosslyn on both Blue and Orange Lines will experience fewer delays, and therefore an increased trip time on average (not considering wait times). To analyze the travel time cost to riders, I created an additional schematic (I've spent several hours this week working on this post--that's what having a cold is good for). The schematic on the left side of the diagram shows the current travel times. Assuming someone wanted to leave Franconia-Springfield at 7:30, they would take train "A." Were they to miss that train, the next one (B) would leave 6 minutes later at 7:36. Since trains take the same routing, B would arrive at each destination 6 minutes after A. Passengers wishing to travel to L'Enfant would save 5 minutes by transferring to the Yellow Line at King Street or Pentagon. On the right side of the diagram, I've shown projected travel times (based on current station-station travel times) with the Blue Line Split. Since approximately every other Blue train at rush hour would follow the Yellow Line, I've assumed that train A would be the re-routed train. It has the same departure time from Franconia as train A does under the current travel time scenario. Passengers traveling to L'Enfant now save 9 minutes over the one-seat ride, and 5 minutes over the transfer-to-Yellow ride. Passengers traveling to Farragut West and Metro Center would still get to work quicker by waiting 6 additional minutes at Franconia for train B, but they would only be saving 3 minutes over train A. But their trip is not actually longer, just their wait. Since trains (even Metro trains) run on schedules--and remember, this rerouting will help on-time performance--the riders in question can just show up at Franconia (in the AM) or Farragut (in the PM) 6 minutes earlier or later and get to work in the same time. The only people inconvenienced by this plan are people traveling to Arlington Cemetery during rush hours. Most of them are tourists, and can use their additional 6 minutes of waiting to puzzle over the Metro map or stand at the top of an escalator. Therefore, I judge the direct cost to Franconia->Farragut riders as 6 minutes each way. Some will not like this. They are already complaining to Dr. Gridlock and Metro, but the time savings for everyone else in the system is quite appreciable. Some have also contended that this scenario will cause confusion. Staff at WMATA have proposed dubbing the reroute, which would only occur during rush hours, the Brown Line. 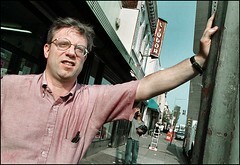 David over at Greater Greater Washington disagrees. He thinks dubbing it the Yellow Line makes the most sense, and I agree. For simplicity's sake, on the diagram showing the re-route, I have colored it light blue. This proposal becomes even more essential (and probably assured) once the Silver Line to Dulles comes on line. With trains from Tysons and Loudoun County sharing tracks with the Orange Line between East Falls Church and Stadium-Armory, service will need to be reduced at WFC, Dunn Loring, and Vienna (see below). These cuts would be less if the Blue Line had a separated subway along M Street, as WMATA is now proposing. Funding for this massive project has not been identified, but in my opinion is more likely under an Obama Presidency. I also think that the Silver Line will eventually need it's own tunnel downtown. After all, as popular as the Orange Line is currently, the Silver Line will serve much more popular destinations. There's not much at Vienna, while the four stations in Tysons will be in the largest job center in the entire state of Virginia. Additionally, Silver trains will run much further into the suburbs than Orange Line trains--so they might be more popular with commuters. At the same time, I don't see the popularity of Vienna's parking garages dropping off. Anyone have any thoughts? Questions? What will this do to headway on the Green Line south of L'Enfant Plaza? The current Green Line headways will not be affected by the re-route. However, putting the Blue Line on the "E Route" will essentially max out service--so future Green Line service would be difficult to add south of L'Enfant. On your last diagram (the one with Silver Line service), wouldn't it make more sense to send all Orange Line trains to New Carrollton and have Blue and Silver trains go to Largo, instead of splitting Orange trains between Largo and New Carrollton? This will reduce confusion because riders will know that ALL Orange Line trains terminate at New Carrollton. I just caught an error that I made. Currently during Rush Hours, Yellow Trains terminate at Mount Vernon Square, NOT Fort Totten. WMATA's proposal to re-route the Blue Line will not affect this. All Yellow Trains will still terminate at Mount Vernon Square during peak periods. About the Silver Line, I'm hypothesizing from WMATA's proposal. We know that with the Blue Line re-route, one Orange Line train every 12 minutes will go to Largo, currently that leaves 2 Orange trains going to New Carrollton and one terminating at D&G Junction. If we assume that the Silver Line replaces two of the Orange Line's headways--but still terminates at D&G Junction, then that reduces headways on the New Carrollton Branch. Therefore, I extended one Silver Line headway to New Carrollton. It's safe to assume that WMATA will not *reduce* headways on the D Route to New Carrollton. I don't know what WMATA will do with routings after the Silver Line opens. 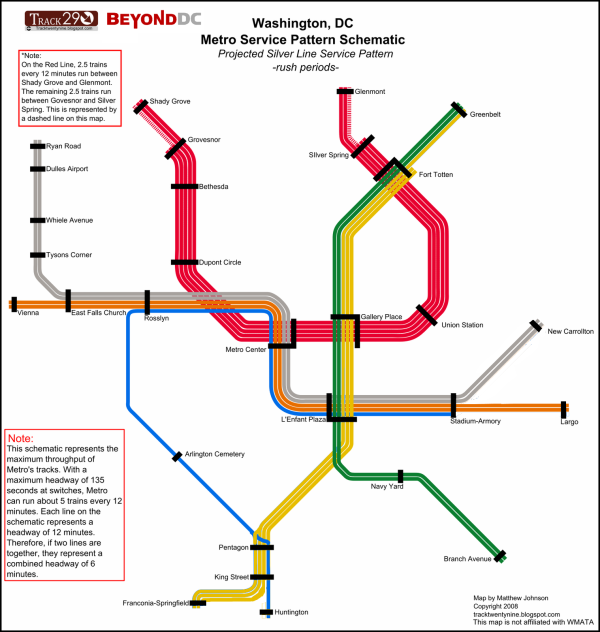 There are three or four things I would change once the Silver Line opens, in order to simplify colors.See this map (sorry for low quality - I'm not at my normal computer and had to make do with GIMP). 1. Runs all Orange line trains to Largo, all Silver to New Carrollton, terminate all Blue at Stadium-Armory. 2. Switch the south side Yellow/Blue terminals, so that Yellow line trains go to Springfield and Blue line trains go to Huntington. 3. Run three trains per period between L'Enfant and Springfield, call them ALL Yellow. 4. Run only 1 blue train per period, from Huntington to Stadium via Cemetery. With this system, we're sacrificing some level of service at Huntington, but in exchange we're avoiding the need to separate colors onto different lines. BeyondDC's improvements are nice (particularly the separate colors)- but I'm going to bring up one element of my unfinished Future Transit Plan and ask what you think of it. It requires approximately $500M to be placed into three connection tunnels, which alleviate much of the Potomac bottleneck that we'll suffer when the Silver Line comes online, for the interim period before we can put up a Separate Blue Line. What software do you use to create your diagrams? I uploaded new maps to adjust for the Yellow Line error I made originally. Please forgive my haste to get the maps up originally. I use a software called Inkscape. It's a vector graphics program which is free to download. is the blue line reroute BOTH ways during morning and evening rush hour? or is it only franconia/springfield into the district in the mornings and the district to franconia springfield in the evenings?? a ton of people (myself included) reverse (sort of) commute from orange in va, transfer to blue to franconia springfield in the AM. for me, an additional 6 minute wait would cause me to drive. two long transfers (due to the metro in alexandria being far away from everything) is pushing it. Yes, to clarify, the re-route would be during both rush hours in both directions. Great map and great analysis. I think you've actually overestimated the time loss for trips to Farragut Square. First, in my experience the average transfer and wait time in rush hour is less than 4 minutes, maybe 150 seconds. Second, many (probably most) commuters to Farragut West have destinations north of the station. For such commuters, the preferred travel route is to transfer to the Red Line at Gallery Place and get off at Farragut North. The rail travel time is maybe 30 seconds less, since there is one less stop, and a typical saving of 90 seconds to 3 minutes in walk time (two or three fewer streets to cross, each with a red light cycle). So the net time loss is 1 to 4 minutes. If you arrive at the station when the next train is an old-style blue line train, the time loss is zero. The average time loss is 30 seconds to 2 minutes. Travel from Alexandria to the Rosslyn-Ballston corridor is, to me, a much bigger issue - the average time loss is 3 minutes (50% chance of an extra six minute wait). Another point I get from this map is that sending Red Line trains to Shady Grove and Glenmont (long promised as the ultimate goal) would drastically increase the capacity in the downtown core. Theoretically, from 5 to 8 trains per cycle, and even if in practice you could only get 6 or 7 it would still be an enormous help. The extra Orange line trains will be put into service at West Falls Church and not East Falls Church as indicated on your map. The trains pull onto the tracks from the yard adjacent to the station or use the center platform at the station to turn around. I think some people get it confused because when the Silver line is done the first transfer point will be East Falls Church. Even though the Silver line is going to run right next to West Falls Church the connection to the tracks is just east of the station. These are great maps. They show that the core is saturated. This saturation means that there is no core capacity to support the Silver Line. Impressive. In your post Silver Line scenario, I recommend dumping the blue line, or providing truncated service to Rosslyn, and just having the Silver and Orange lines use the tunnel. Anyway, I have written about these kinds of issues for some time. I envy your facility with graphic design. Your maps are great!!!!!! Re Chuck Coleman's comment. The problem is that by derogating responsibility for expansion planning to the jurisdictions away from WMATA, no one plans for the entire system. The Silver Line shouldn't have been allowed to go forward without adding a tunnel crossing into DC. 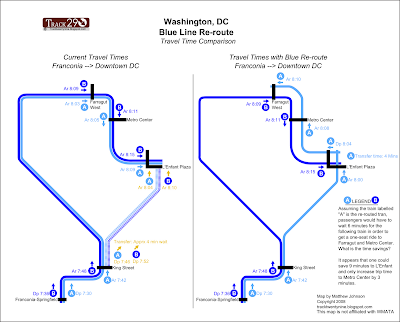 Plus it should have been used to jump start planning for the separated blue line, which should be just called the Silver Line and the blue line can be truncated to Rosslyn only. You are correct about West Falls Church. When I set up the maps, I erroneously thought that WMATA intended to run all Orange Line trains to Vienna. After rereading the report I discovered my error. But, I didn't add a new station, I feared the maps were very busy already. I certainly appreciate your commentary, and am a follower of your blog. I do however, think the Blue Line needs to stay, although it would be best if it got its own tunnel. One of the good design features of the Metro here is that all trips on the subway require no more than two seats at a maximum. Curtailing the Blue Line at Rosslyn would require riders transferring to the Green or Red Lines to transfer twice, for a three-seat ride. An additional hurdle is the lack of a pocket. Without a pocket track, WMATA cannot terminate trains if the through headways are less than about 10 minutes. For instance, the Yellow Line cannot be extended to Fort Totten during rush periods because it would cause too much congestion. The Yellow Train would only have 3 minutes to clear the outbound track E1 at Fort Totten, and that's apparently not enough. They also don't have enough railcars, but even if they did, they'd need to run Yellows all the way to Greenbelt or build a pocket. At Rosslyn, frequencies would be too high to terminate Blues at the platform. 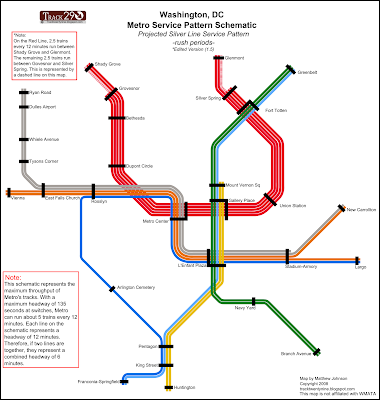 Additionally, there's no crossover, so trains would actually have to run to Foggy Bottom, go out of service between Foggy Bottom and Farragut West, and return to Franconia. Alternatively, they could wrong-rail from Arlington Cemetery all the way into Rosslyn. One way to solve the line confusion issue once the Silver Line opens would be to terminate Blue Line trains at Stadium-Armory, and replace Largo service with Silver trains. For you mathematicians out there, you might also have found a little extra capacity. If Metro can run trains every 135 seconds and there are 720 seconds in 12 minutes, Metro can actually run 5.33 trains every 12 minutes at any given choke point in the system. I simplified this to 5 trains/12 minutes, but there is some room for delays. Additionally, service is not quite as clean cut as portrayed here. There are two more Green Line trains per hour than Yellow Line trains during rush hours, which fit into the .33 added up 5 times over an hour. Anyway, the maps I made are just basic models and they are simplified for clarity's sake. - but you are only at 55% of capacity. Impressive analysis and very informative. I really appreciate you posting this -- and wonder where is the Washington-Post and other conventional news outlets on fostering this discussion and educating the rest of D.C. Here's a few thoughts: Will having a bifurcated Blue Line confuse tourists? Would it make more sense just to have it go north-south through L'Enfant all the time? Then you could have (insert color here) going back and forth between Rosslyn and the Pentagon. Very few folks *work* at National Cemetery, it's more of a stop to pay homage to those who paid the ultimate price for our country. You could have two trains each on a track shuttling back and forth throughout the day? And personally I'd suggest calling such a shuttling service between Rosslyn and the Pentagon the "Purple Line" after the "Purple Heart" awards. Lastly -- I think the data needs to be updated on where the majority of riders come-in on the Orange Line. I'd suggest, following the price-shock of gas prices a few years back and changing Fairfax demographics -- the bulk are Vienna and West Falls Church -- namely a lot of commuters who park and then take the train in to the District vs. motor along I-66. Recognizing 2010 Census data hasn't be released, but I'd be interested in an updated assessment of where the most riders for the Orange Line get on -- with my money on West Falls Church and Vienna because of the parking decks?